The Oitavos is a five-star luxury hotel located in a picturesque spot at Quinta de Marinha that borders Oitavos Dunes Golf Club and overlooks Portugal's stunning western Atlantic coastline. Since opening for play in 2001, Oitavos Dunes has become one of the most sought after golf courses in the whole of Europe, owing much to its outstanding layout and truly awe-inspiring environment. Sites for golf courses don’t come any better than this, and with the land he was presented with, American Arthur Hills has created something special. Hill, who is well known for his body of work in the USA, carefully considered the natural environment in which he was working while constructing the course and as such it blends seamlessly into its natural surroundings. Thanks to such careful consideration Oitavos Dunes has received a number of awards for its environmental awareness. From all over this spectacular course you can enjoy views of the vast Atlantic Ocean thanks to the routing of the holes. Nine holes out and nine holes back is a throwback to the classic links courses found in the UK & Ireland and with firm sandy turf as a base, the course plays and feels much like its ancient cousins. Although the course is on the coast and composed much like a links, in the strictest sense of the world is it not thanks to the rows of trees that frame many of the fairways. Precision is the order of the day at Oitavos Dunes as the trees, and waste bunker areas, mean anything hit significantly off line will surely be punished. 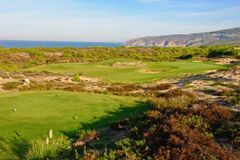 This new addition to Portugal's golfing landscape is more than welcome, and delights every player fortunate enough to include it in their golfing holiday. Set amongst sand dunes and umbrella pines, and adjacent to the award winning Arthur Hills-designed Oitavos Dunes golf course, The Oitavos is the first 5-star facility in the area and has all the ingredients for a making a golf trip here unforgettable. The Sintra Mountains and Europe's most westerly point, Cabo de Roca, can be seen from one direction, the Atlantic Ocean and the championship links, recently ranked 68th in the top-100 world golf courses, from the other. Mountains. The hotel is similarly specified with outdoor saltwater pool, sauna, steam room and a superb Spa featuring natural and organic products and wellness treatments. For the more active guests there's an equestrian centre, tennis facilities at the health and rackets club or wind-surfing on hand. &Dining options include the Ipsylon Restaurant, a fine dining restaurant that is perfect for celebrating a special occasion or a quiet, romantic evening together. Les Herbes, meanwhile, provides an indoor/outdoor dining experience that offers breakfast to hotel guests as well as lunches and dinners to groups on request. Dining out is also a joy here with the bustling towns of Estoril, Cascais and Sintra nearby.